Miller Blue Star® 185 welder generator provides class-leading welding and generator power and offer features to increase your productivity and decrease your fuel costs. The Miller Blue Star 185 is power and reliability in a compact engine driven welding package. Reliable Blue Star engine drive is the standard for portable welder/generators. Standard electric start for easy engine start-up. Compact and portable, its small footprint uses little truck space. Optional running gear also makes the Blue Star one-man portable. 120 V GFCI and 240 V receptacles provide power for jobsite tools. Receptacles are circuit-breaker protected. Receptacle covers improve reliability by protecting receptacles from debris. Miller Bluestar 185 Spark Arrestor for Miller Bluestar 185 welders manufactured AFTER 9/1/2014. Genuine Miller® Tune-Up Kit for your Kohler® CH440 equipped Miller Bluestar 185 welder manufactured AFTER September 2014. Miller Blue Star 185 Welder 907664 will not scratch start tig weld aluminum. How many decibels it operate at? I'd be interested to know if I can plug a MILLER SUITCASE X-TREME 8VS to this Miller Blue Star 185 Welder generator? Miller advises that the Miller Blue Star 185 Welder 907664 can be used to run a 8VS feeder. Since the Bluestar produces constant current weld output the 8VS would have to be run with the CC/CV switch in the CC mode and in this mode it will pretty much limit the 8VS to flux cored wire welding only. 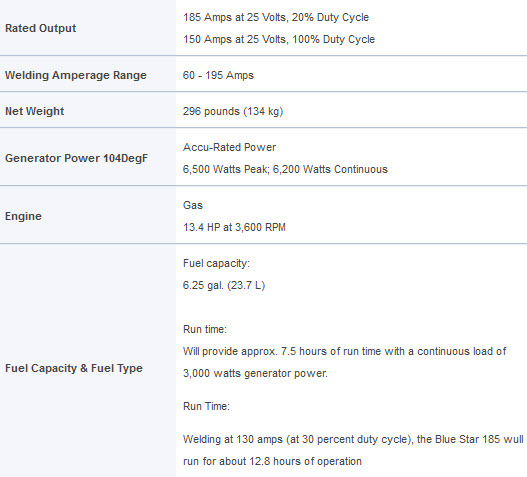 Looking at the specs of the Hypertherm Powermax 30 Air it looks like the Bluestar is capable of running it. Could you confirm this for me please. Thanks. Yes, based off of the specs provided by Hypertherm, the Blue Star 185 is capable of running the Powermax 30. Can the Bluestar run any of the Miller plasma cutters? The Miller Blue Star can run the Miller Spectrum 375 X-TREME at it's full capability. You could also run the Spectrum 625 X-TREME but you may run into an issue with the amperage pull if you wanted to run it at it's full capability. Could I run a dynasty 200 off of this machine? No, the Dynasty requires 9000 Watts of generator power and the Blue Star 185 only supplies 6500 Watts. Can the miller blue star 185 run the Esab Rebel welder? The Miller Blue Star 185 could run the ESAB Rebel, but not at it's full potential. Can you give a link or tell me what the input looks like for the stick welding and ground leads. How loud is it. How many decibels? Also can I run an LN25 off of it? What is the maximum thickness of steel this machine is able to weld, and also what all would I need to get to be able to stick weld with this machine ? Thanks! What is included with this welder, do I also need to purchase my lead/grounds, battery, etc? Can you run a miller 8VS from this machine? The Miller brochure/ spec sheet for the Miller Blue Star 185 Welder 907664 is available for down load right off of our web site. if you go here ....http://store.cyberweld.com/miblst185end.html.... you will see a picture of the Bluestar 185. Under the picture you will see 4 tabs. One of the tabs is labeled specifications. Click on this tab and the brochure/ spec sheet will down load. You can print a copy of this brochure/spec sheet directly from here. Can this machine power this machine Hobart AirForce 40i Plasma Cutter 500566, and the compressor needed? How thin and thick will the Miller Bluestar 185 907664 weld and with which rods? I keep seeing answers for the 185DX which I believe has been discontinued. What is the brand of the engine on the Miller Blue Star 185 welder? Is this a two or four cylinder engine? The Miller Blue Star 185 Welder 907664 has a single cylinder 13.4 hp 4 cycle air cooled overhead valve engine. Miller Blue Star Lifting Eye 195353 cost would be $125.00 Yes if you buy the cable set along with the machine you would qualify for the $200 rebate. 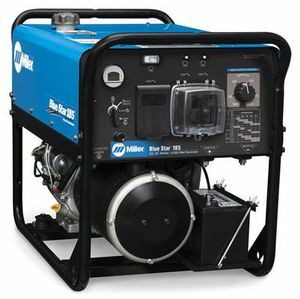 my Miller Blue Star dx welder/generator will not stay running. When I try to start it it runs for a few seconds and then shuts off, and that's only when I spray the filter with starting fluid. What should I do. It sounds like your Miller Blue Star 185 Welder 907664 may have an issue with the oil pressure shut down switch.. This switch is designed to shut the machine down if it does not detect oil pressure within a few seconds after start up.If your Miller Blue Star 185 is of recent vintage the oil pressure switch will in found inside the engine which makes replacement difficult. We suggest that you contact local Miller authorized service facility for your repair options. Mounting in a work truck. Says all controls on front of welder, can I start without climbing in to turn on gas valve? The Miller Blue Star 185 Welder 907664 fuel shut off valve is located on the opposite side of the machine from the control panel. Depending on how you plan to mount the machine in your truck will determine whether you will need to climb into the truck to turn the fuel valve on.and off. Welding Supplies from IOC offered me a price of $2643. Would you guys match or beat that price? Can it weld aluminum? Can it come with a 30A RV outlet? You can weld aluminum with the Miller Blue Star 185 Welder 907664 if you use aluminum stick electrode..We are not sure what you mean by 30 amp RV outlet. The Blue star 185 comes with four 120 volt GFCI recepticles and one NEMA 6-50 240 volt receptacle.. Does this Unit come with leads or are they separate? Is there any other add on I need to purchase? What is Max thickness of steel in single pass & Max size electrode rod can be used. I am welding mild steel 2 3/8 pipe and would like weld fence H posts in single pass. Can this welder weld this in single pass or would it take serval passes to weld it properly? You did not indicate the wall thickness of the pipe you are welding but Miller advises that the Miller Blue Star 185 DX Welder 907591 can weld up to approx. 3/8" steel in a single pass..The 185 will run a 5/32 electrode at 100% duty cycle and can run up to a 3/16 electrode at 20% duty cycle . Can I use this as a backup home generator? If so, do you think I could run a central air system on it? Is there a gas hook-up and a remote contact plug-in for TIG welding? It says in the product description TIG is one of the processes. What is the maximum steel thickness this unit can weld properly in "Stick" mode? What is the max steel thickness this unit can properly weld in "stick" mode? Does this 185 DX weld in reverse polarity? If so, how does one switch from straight DC to reverse polarity? Thanks. Is there a cart that can make tranporting this welder a one man job? I plan on working by myself in most insatnces, therefore I would also want to get it off my truck as well, which I only assume that would probably require some fabrication of steel to assist in that process. So wheeeling it by one man is very needed by me. I would appreciate this answered within the next few business days if possible.. Thank You for your answer and your time ! ! You would need to design a ramp, but one man certainly can wheel this around with this running gear. The miller blue star 185. is this item new or used? 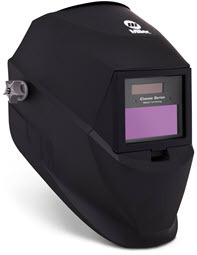 Miller Blue Star 185 DX Welder 907591001 comes brand new from Miller warehouse. Does this welder come with the welding cables or a protective cover? Miller Blue Star 185 DX Welder 907591001 is sold as machine only. Accessories can be found under the accessory tab. The Miller Blue Star 185 DX 907545001 has a Kohler CS12.75 Engine. Is this of good quality? Yes, this is very well built. The carburetor mounts broke and GFI's stopped working at ~80 hours. NOT warrantied. It runs all but the plasma cutter just fine. I should have bought something cheaper for the consideration that it fell apart so quickly. Unimpressed that Miller wasn't willing to navigate the $850 repair, despite that it was under the 3 year warranty. Cyberweld was awesome, that was one of easiest and best online purchases. Customer service was great professional and courteous. The Miller Blue Star 185 is the perfect welder for farm and ranch. Take it out of the box put gas in it and start welding. It doesn't get any better than this. Welder works great. The Ac generator is powerful enough to run my mig welder. Only downside is the running gear is not included with the welder. Cyberweld is a fantastic company and will absolutely be ordering more stuff in the future. I'm a long time Miller fan because their machines deliver and typically have very low maintenance. It was a good price also. Really liked how they called me before the welder shipped and said if there is any damage from shipping send it back we will get another one out right away excellent customer service been telling everyone. Consistantly Good to deal with. This is my third machine bought on line from Cyberweld and each one has been an easy, fast, economical, and trouble free purchase . Welder as advertised, quick shipping. Appreciate the good price and free shipping.